We all have our favorite preferences and our own methods of practicing and using Technical Analysis when it comes to trading the markets. The reason why all traders don’t use the exact same indicators is most likely because using just one indicator doesn’t work on its own all the time. So traders will continuously and at times unsuccessfully search for the ideal indicator, all in the hopes of giving them that inside edge, crystal clear buy and sell signals. There’s no one single indicator which will consistently work 100% percent of the time, but if you use and test out the various TA tools which are available, one or a combination of them may eventually help you in increasing the odds in your favor based on your trading style. The best method for most is to just analyzing the long-term charts. Begin by looking at the long term monthly charts, then the weekly charts, and then the daily’s. Go back at least a year if possible. Looking at larger scale maps of the particular market should provide you with a better visual long-term perspective on how that market is behaving. Once the long-term trend has been established, then begin looking at the daily as well as the intra-day charts. The short-term view of the market can however often be a little deceptive. Even if you happen to be a short-term trader, you’ll be better off if you place your trades in the same direction as the long term trends. First, determine where the trend is headed and then try to follow it. Market trends will usually come in various sizes: short-term, intermediate-term and long-term. You’ll need to decide which time period which you’re going to trade and then find the appropriate chart. Make sure that your trading in the same direction of that trend. Buy on the dips of the market if the trend is going up. If you happen to be trading the intermediate or mid trend, use daily as well as weekly charts for trend reference. If you’re a day trader, use the daily as well as the intra-day charts for reference. Make sure that you allow the longer time range charts to determine the initial trend, and then trade the shorter term chart for initial timing and entry into the market. Find and mark all the support and the resistance levels. The best place to enter a “buy” in the market is when it’s near support levels. That support is most often a previous reaction to a low. The best place to enter a “sell” trade is when it’s near resistance levels. Resistance most often is a previous peak. Measuring the percentage of retracements. Market correction, whether it’s going either up or down will usually retrace at a significant point of the previous up or down trend. You can measure the correction of an existing trend by using simple percentages. By using a 50% percent retracement of the trend is the most common. A minimum retracement will usually be approximately 1/3 (33% percent) of the previous trend. The maximum retracement will usually be around 2/3rds (66% percent). Key Fibonacci retracements such as 38.2%, 50%, 61.8% and 78.6% are important to track as well, as are pivot points. During a market pullback when it’s in an uptrend, the initial buy points will be in the 33 to 38% percent retracement areas and vice-verse. Trend lines are the most visual as well as the most effective and simplest of charting tools. All that’s required is drawing a straight edge by connecting two bottom or top points on the chart. Trend lines going up are drawn along the two successive low points. Down trend lines are drawn along the two top successive peaks. The prices will usually pull back to the trend lines before they resume their trend. Once the line breaks through the trend, that usually signals that a change in trend is occurring. A trend line to be valid should bounce off it at least three times. The longer that a trend line has been active, the more prominent that trend becomes. Moving averages or MA will provide for objective true buy and sell signals. They’ll tell you if an existing trend still happens to be in motion as well as confirming a trend change. Moving averages will not however tell you in advance that an upcoming trend change is imminent, it will just react to it. Using a combination of two moving averages is the most effective and popular way of potentially finding trading signals. Some of the most popular combinations of MA are 4 and 9 day/candle moving averages, 5 day and 20 day/candle MA and the 5/13/62 MA as well. The trading signals are revealed once the shorter MA line crosses the longer one. The price crossings above or below a 200-day/candle moving average also provides for a good trading signal. Since the moving average chart lines are basic trend following indicators, they will work the best in a trending market and not a market that’s in a zig-zag pattern. Oscillators will help to identify overbought or oversold markets. While the moving averages will offer confirmation of a potential market trend change, the oscillators will often help in warning the trader in advance that the market has decided to rally, or it has fallen too far and the market trend may soon turn. The most popular of the oscillators are the Stochastics and the Relative Strength Index or (RSI). They are both placed on a scale of 0 to 100. Using RSI, any reading over 70 is considered overbought while any reading below 30 is considered oversold. The overbought as well as the oversold values for the Stochastics oscillator are 80 and 20. Most of the traders will use the 14-day or 14 weeks for stochastics and either a 9 day or a 14 day or weeks for the RSI. Oscillator divergences will often warn you of any potential market turns. These tools will usually work the best in trading market ranges. If you’re using weekly signals, they can be used as filters for the daily signals, while the daily signals can be used as filters for the shorter intra-day charts. Trading using MACD. Using the MACD or Moving Average Convergence Divergence indicator, combines a moving average crossover along with the overbought and oversold features of an oscillator. A MACD buy signal occurs when the faster line crosses above the slower line while both of the lines are below zero. A sell signal takes place when the faster line crosses below the slower line when it’s above the zero line. The weekly MACD signals should take precedence over the daily signals. A MACD histogram will plot the difference between both lines, as well as giving even earlier warnings of potential trend changes. The reason why it’s called a “histogram” is because there are vertical bars which are used to show the differences between the two lines of the chart. When using ADX, or The Average Directional Movement Index, the line will help you in determining whether a market is in a trending pattern or if it’s in a trading phase. The ADX will measure the direction of the market as well as the degree of a trend. A rising ADX line will usuallly suggest that there’s a strong trend. A falling ADX suggests that there’s a potential trading market while absence of a trend. A rising ADX line will favor moving averages while a falling ADX will usually favor oscillators. By tracking the direction of an ADX line, the trader can determine which trading style to use as well as which set of indicators are the most suitable to use for the current market conditions. Using volume and open interest are important as confirming indicators in the markets. Volume usually precedes price. So it’s important to make sure that there is heavier volume that’s taking place in the same direction of the prevailing trend. When in an uptrend, the heavier volume should be visible on the up days. Rising open interest should confirm that there’s new money that’s supporting the prevailing trend. Declining open interest can be viewed as a warning signal that the trend is near its completion. 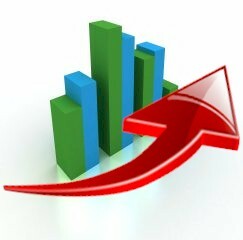 A price uptrend which is solid should be accompanied by rising volume as well as rising open interest.